If you are interested in adding this book to your library Buy It Here! For more information about Round is a Tortilla, Roseanne Greenfield Thong and John Parra, or possible lessons click here. 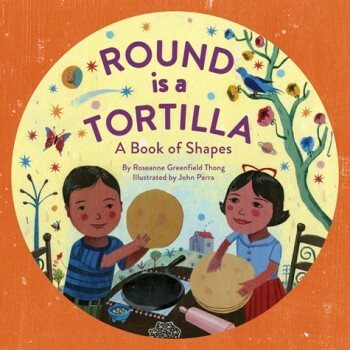 Round is a Tortilla: Book of Shapes by Roseanne Greenfield Thong discusses certain cultural aspects of a young girl's Latina background. She connects shapes to different foods, games, and activities that her and her family do. Each item she mentions, relates to her heritage and things she does on an everyday basis. As she continues, the young girl asks the reader to think of items within their own lives representing each shape. The girl uses Spanish words within the text because that is how she refers to them at home. The illustrations make it simple to figure out what each word means if you are not sure, but the book also provides a glossary of the words in the back. Round, square, rectangle, triangle, oval, and star are the shapes that are used, however, the end of the book asks "how many more shapes do you know?" This represents the idea that these are what she knows and can relate to but other people and cultures may see many different shapes around them. This would make a great book for children to understand the use of shapes in the real world. They can each figure out where they see each shapes in their lives, while also thinking about and understanding their culture. The girl in Round is a Tortilla knows a lot about her culture. She understands it all through the shapes that she sees. While sharing what she knows, the story also represents her Latina heritage. She is very proud of her life and shows it through her examples of each item. Her expressions of food, music, events, and family are not just shapes, they are a lifestyle. Roseanne Greenfield Thong's book is an excellent representation of Element 1: Self-Love and Knowledge because the girl really does enjoy her life as a Latina and everything that comes with it. She embraces her culture and continues to learn as much as she can about it. Round is a Tortilla portrays the way a young girl lives her life and the things she loves most about it. It explains what she sees in her culture in the best way she could represent it. In my classroom, I would like the students to use what they have seen this young do and try to create their own short story. First, each child would think of certain parts of their life/culture that are important to them. Then on a sheet of paper they could each use those moments to consider certain items that can represent them. Since every item has a shape, they can make their own list of shapes and objects that represent their culture. Most of the children will not be able to write many of the objects so pictures will do just as well. This helps them draw out the shapes for further recognition of them. When everyone is finished, they can be presented to the class with explanations about why they chose it. The images can be posted around the room with the child's name so everyone can view them as many different individuals in one cohesive classroom.